Competing in Google Shopping is tough—there’s no denying it. When you consider that Google Shopping spend has overtaken spend on the search network in the US, accounting for 56 percent of spend by retailers and 46 percent of clicks, it is now more important than ever for retailers to have a solid, well thought-out Google Shopping strategy. 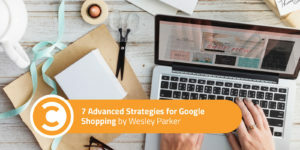 Below are seven highly effective, advanced strategies for maximizing your performance on the Google Shopping platform. First, segment your products depending on the type of search query. Performance varies significantly depending on the type of search query. For example, if somebody is searching for “Nike trainers,” you might want to bid more than if somebody was simply searching for “trainers,” because Nike trainers are generally more expensive a well-known brand, so shoppers are more likely to convert. This can be done by creating two separate Google Shopping campaigns containing “trainers” and then adding branded terms as negative keywords in one. This will then become your non-branded campaign where you want to reduce bids. The other will then become your Nike branded campaign, where you will want to increase your bids. A second key factor to success on the Google Shopping network is the pricing of your products. The message from Google is clear: If you overprice your products in comparison to your competitors, your ads won’t show as often. Asics learned this when they made their pricing more competitive and saw a 231 percent increase in impressions simply by changing the prices of their products. Bidding on the Google Search network is pretty straightforward: Increase your bids by a small amount, and you will see a small increase in impressions and conversions. The Google Shopping platform, however, is much more volatile. Increasing your bids by a small percentage can lead to significant increases in revenue and profit. To capitalize on this, it is key that you are continually testing bids to find the best balance. Google Shopping has no keywords, so it is fundamental that you optimize your product feed so that Google knows when to show your products in search. One of the most important places to include keywords is within the product title. If you want your Google Shopping ads to show up when shoppers search for “party dresses,” they you should place that keyword within the product title. When Lispsy London did this, they saw the number of impressions for that term jump from 419 to 4023. Interestingly, they also saw an increase in the number of impressions for other relevant products too. The fifth optimization tactic is segmenting products by product ID. Placing each product within its own ad group allows you to set bids for each individual product. Products vary significantly in price and profit margin, so you will want to bid more on higher profit margin products and lower on low profit margin products to maximize performance. If you are currently using the “All products” bucket, then you could see conversions increase by as much as 280 percent and CPA decrease by as much as 85 percent by implementing this strategy. Splitting hundreds of products out into their own ad groups is time consuming, especially if you have a large product catalog, but it is well worth it. If you want to save time, you might want to use a tool such as Optmyzr or Camto that allows you to do this automatically at scale. The sixth tactic is changing your bids 24 hours per day. Conversion rates vary depending on a huge number of factors, such as device, gender, age, time of the day, and hour of the week. One of the limitations of Adwords is that it only gives you six different windows per day to set bid modifiers, but conversion rates vary hourly. To compensate for this, use an Adwords Script (such as this one by Optmyz) that allows you to get around this and change bids 24 times per day (once per hour). Finally, as most of you know, users that have previously visited your website are more likely to purchase from you than people who are visiting for the first time. (This is why remarketing works so well.) So why not use remarketing for Google Shopping ads? RLSA can be applied to your Google Shopping campaigns and have been shown to increase click through rates and conversion rates by as much as 4X. To get the best performance, segment your remarketing audiences depending on what pages they have visited on your website. For instance, if they have visited your category page, you might want to increase bids by 10 percent. If they have visited your product pages, then they are likely to be further down the buying cycle and know which products that they want to purchase, so you might want to increase bids by 20 percent. Cart abandoners are the second most likely people to purchase, so you should increase your bids by more, possibly 30 percent. Existing customers are the most likely to purchase from you, so you will want to bid the highest for them—a bid modifier of 40 percent, perhaps. By implementing these seven advanced Google Shopping strategies, you should see a significant increase in performance in terms of conversion rate, revenue, and profit. If you do nothing else today, implement tactic number four and segment out your product feed by product ID, as this will give you the most bang for your buck, with increases in conversions by as much as 290 percent. This infographic was first published on Clicteq and has been republished with permission.